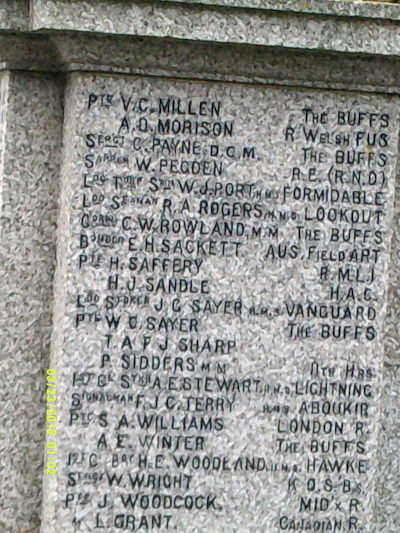 Edmund is commemorated on the war memorial in The Square, Birchington, "Bomder E. H. Sackett, Aus. Field Art." GRO Indexes to Births, 1837 to date, "Mar qtr 1896. Sackett, Edmund Herbert. Mother: Else. Faversham. 2a:850." Baptisms Register, St Mary of Charity, Faversham, Kent, digital image, Findmypast, "26 Mar 1896 Edmund Herbert Sackett son of George & Louisa, 41 Westgate Rd, plasterer." Edmond H Sackett, son, 5, b. Faversham. Alice Elmer, gdau, 13, school, b. Battersea, London. Website Victoria, Australia, Assisted and Unassisted Passenger Lists 1839–1923 (Ancestry.co.uk) (http://www.ancestry.co.uk), "Mr Edmund Sackett, 18, British, arr. Melbourne, 17 Mar 1914, from London, ship Norseman." Website National Archives of Australia, Australian Imperial Force, Enlistment Papers (http://naa12.naa.gov.au/), Australian Imperial Force. Attestation Paper of Persons Enlisted for Service Abroad. "1138, Sackett, Edmond Herbert; unit: 8th Reinforcements 8th Light Horse Regiment, trans to 3rd. L.H. Reserve Regt. ; joined: June 20th, 15. Edmond Henry Sackett, b. Birchington on Sea, Kent, Eng, Btsh born, 19 yrs, farmer, single, next of kin (mother) Louisa Sackett, of 3 Perfects Cotts, Birchington on Sea, Eng; civil convictions? : no; ever discharged from HM Forces? : no; any military service? 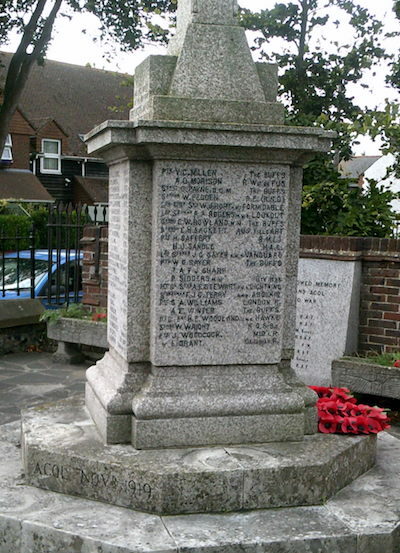 : 18 mos 4th Batt West kent Regt, granted discharge; ever rejected as unfit for HM Service? : yes, [no grounds stated]; signed: E H Sackett, 20.6.15." "In loving memory of my dear husband Louis Henry Sackett who died 12 Dec 1911 after 2½ years of suffering patiently borne aged 26 years "Rest in peace"
Also Louisa Sackett mother of the above, died 22 May 1926 age 73 years. "Her end was peace"
Lilian Martha Sackett, died 9 Dec 1943 aged 63 years." Website Commonwealth War Graves Commission (www.greatwar.nl), "Sackett, Edmond Herbert, Bombardier, service no. 1138, d. 08/10/1918, age 22, 12th A.F.A. Bde, Australian Field Artillery, nationality Australian, grave/memorial ref. V. R. 3., Bellicourt British Cemetery, Aisne, France, son of Louisa Sackett, of 3, Parfects Cottages, Birchington-on-Sea, Kent, England, and the late George Sackett. Casualty Type: Commonwealth War Dead."